A Sweet and Huggable Friend for the 2013 Holidays! The holidays are right around the corner, and if you have a young girl, you might be struggling with finding the perfect gift for your daughter. How do you bridge that gap between toddler toys and baby toys? What still qualifies as a choking hazard? It’s hard to know if your young daughter will even play the toys you are getting her. For many little girls, social activity is paramount to a healthy childhood. However, sometimes other people aren’t available for interaction, and this is when a doll becomes a girl’s very best friend! Little girls relate to dolls, they see themselves in them, and they look to them for support, love and fun as they go through life together. For children over the age of two, the Mooshka Sing Around the Rosie doll is a great friend for them to learn and grow with. Now that your little girl is walking, talking and gaining independence, a “baby” doll is no longer their equal; it is a younger infant to take care of. Dressed in adorable headbands, tights and tresses, Mooshka Dolls are more “best friend” than baby and are the perfect partner-in-crime for your growing girl. Remember the paper dolls we all used to dress up as children? Mooshka dolls are paper dolls come to life! Through the power of love and friendship, they became sweet, huggable 15” dolls, the perfect size to accompany girls on all of their adventures. And better yet, Mooshka Sing Around the Rosie Dolls really do sing! When you hold both of their hands, they croon the words to “Ring Around the Rosie,” allowing girls to sing along and dance. You can hold both of their hands yourself, spin in circles and sing to your hearts content or you can invite your Mooshka doll to join you and your friends as you spin and sing together.Just as long as both of your Mooshka dolls’ hands are held, she will lead you in song for as long as you wish. 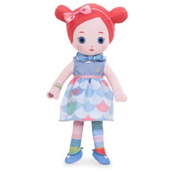 While Mooshka offers many different dolls with various looks and hobbies, there are three different Mooshka Sing Around the Rosie dolls that are as fun and interactive as they are adorable. Myra, a summer baby with bright red hair and blue eyes is a natural born actress. For any little girl who likes to be the star of the show, Myra will keep her company while she reaches for stardom. Pink-haired Niva is more of an artist, and will be a great friend for your future writer as they pen poems and letters together all day long. Lara, with green eyes and a flower in her hair is the most adventurous of the bunch! She loves to collect seashells, and will be sure to accompany girls on all of their backyard adventures. Mooshka dolls are a great holiday gift for any little girl in your life. Dressed in cute dresses and headbands, it will be easy for your daughter to see herself in them, and recognize them as friends and equals. Additionally, the Mooshka fun doesn’t stop with the doll: the Mooshka website offers e-books that you and your daughter can read together or she can play on her own, cute crafts, like paper dolls and puppet theater backdrops, and seasonal Mooshka decorations. With so many additions, it will be easy for girls to immerse themselves in the world of Mooshka. Mooshka dolls are also great for when girls spend time with their real-life friends, as they can all hold their Mooshka doll’s hands and sing Ring Around the Rosie together. For any young girl over the age of two, Mooshka dolls are a great holiday gift that will offer your child endless fun. You can buy your very own Mooshka doll at Toys-R-Us, Wal-Mart, Amazon.com, Target or Little Tikes. Freelance writer, Jordyn Fisher, contributed this article on behalf of Mooshka dolls, a product of MGA Entertainment. Adorable doll! Sana ito na lang ni-regalo sa kanya nung birthday niya. (LOL nagdemand!) I love rag dolls like this. I hate real looking dolls, I find them creepy and reminds me of Chuckie hehe.